The words Kung Fu (功夫）can be literally translated as skill from effort. It can be used to describe anything that requires a person to invest both time and effort into training to become skillful. 2,500 years ago Buddhism was founded in Nepal. About 2,100 years ago Buddhism spread to India. 1,500 years ago an Indian Monk called Bodhidharma traveled to China and he developed the teachings of Chan Buddhism. 495 A.D. The Shaolin Monastery is built in Henan (河南) Province. The first abbot is Ba Tuo (跋陀). 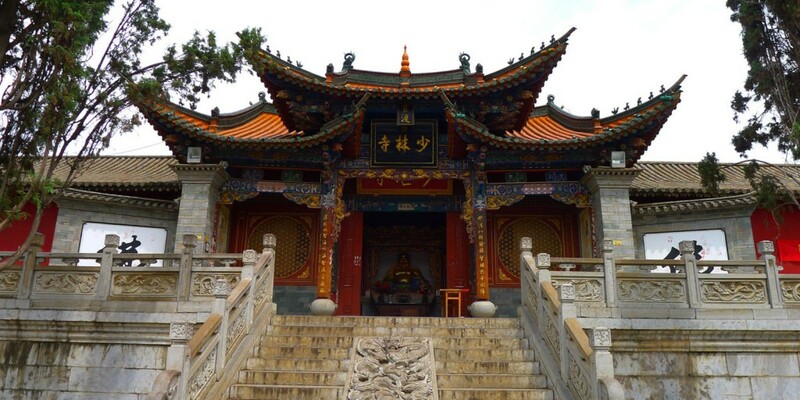 Ba Tuo received the land at the foot of the Shao She mountain from the Chinese emperor to build the monastery. The name Shaolin comes from the Shao She (少室) Mountain and from the forest that surrounds it. The Chinese word for forest is Lin and for temple it is Su. Shao Lin Su = 少林寺 = Shaolin Temple. Sigung Chong Oi Mun, a student of Li Sai Wing (林世榮), was the first to bring this incredible art to Canada. However, this undertaking was not without its share of trial and tribulation. At the time he started teaching, Kung Fu’s reputation had been tarnished – as it had become associated with the Triads – the Chinese Mafia. On the other hand, Karate had no such negative ties – and was considered to be good for discipline. In order to build up a student base, Chong Oi Mun taught a Karate system to beginners and as the serious students progressed, they would learn the art of Shaolin. This combination of Karate basics and Shaolin flow has culminated the very unique style form we are taught today. the Snake pulls them all together, building chi energy, accuracy, and timing. In addition, each animal form has its own strategy of combat – the Leopard, for example, is particularly effective against smaller opponents. Tiet Hsin Kune trains the body to open and close, and float and sink. Most importantly, this form develops the twelve bridges and the correctness of breath. For example, one of the most famous forms is Fu Hok Shoeng Ying Kuen (Tiger Crane Form) and is said to have been developed by Wong Fei Hung. This form stresses the cultivation of the Tiger and Crane as well as a balance between the two complementing each other in the form. While the Tiger is utilized for teaching one to refine his physical entity (power), dynamic tension breathing skills and courage. The Crane develops whipping power, evasive tactics, waist movement, and calmness of the spirit and balance. The Tiger form of training provides the hard or external methods of the style while the Crane form provides the soft or internal balance between the two. It is generally believed that Wong Fei Hung was in his peak during the mid 1860’s. Lam Sai Wing would then have taught in the 1890’s and Li Sai Wing in the 1930’s. Chong Oi Mun arrived in Canada in 1962 and started teaching Sigung Yamanaka. At this time, in the first decade of the year 2000, Sigung Yamanaka is passing down the teaching to many students, with two of them being Sifu Mike & Laura Sywyk; an honour bestowed upon him by the original founder – Sigung Chong Oi Mun (David Chong). Thousands of students have trained with Sigung Chong.